Next Monday (October 8th) the University of M.U.S.C.L.E. will properly reveal arguably the biggest M.U.S.CL.E. discovery ever. Why not today? Mainly because the pictures aren’t ready – but secondly because this discovery deserves some special attention and excitement. 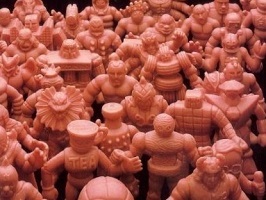 This will be the biggest M.U.S.C.L.E. event of 2012. This entry was posted on Tuesday, October 2nd, 2012 and is filed under Research, UofM News. You can follow any responses to this entry through RSS 2.0. You can skip to the end and leave a response. Pinging is currently not allowed. It better be good, or else~! By you saying “Discovery”, that implies that it is information regarding the past MUSCLE line, and not news on the possibility of a new one. I’m going to guess that there is information regarding more MUSCLE cases being found, leading to new information regarding the SR. I won’t say if Ironmask is on the right or wrong path, but I like his thought process!